An ongoing series in which I ask people what their lives were like at my age – even if they’re not very far from my age. 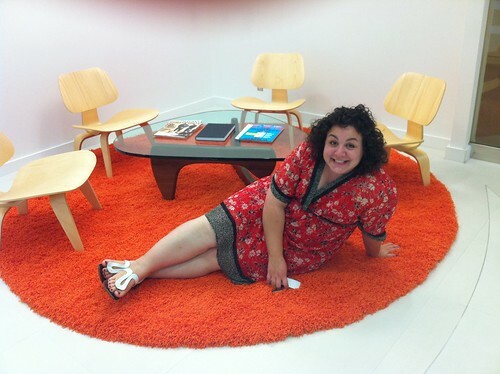 How, how, how to introduce Emily Goodstein? I probably don’t have to. If I were playing the “Six Degrees of Separation” game and wanted to start with someone I knew personally, I’d ditch Mr. Bacon and use Ms. Goodstein. This birth photographer, lover of DC and Austin, social media die-hard, reproductive justice advocate, and shutterbug behind the illustrations in the forthcoming book The Washington DC Chef’s Table is constantly on the move, making connections, and sharing life’s moments on Facebook…yet somehow manages to send personal, thoughtful thank you cards and get full nights of sleep more often than anyone I know. E: I had such a lovely day. I was (and always have been) living in Washington, DC so I scheduled a massage for myself in the morning and had dinner with some good friends and my family at a very delicious restaurant called Ris. I love it there for many reasons, but mostly I love the fact that they have butterscotch pudding on the menu which I ordered for dessert. They put a candle in it. I was in the middle of some difficult things (a good friend was/is dealing with a very scary health situation and I remember she’d just made plans to travel to another city for a long term course of treatment), but it was a very splendid day none the less. J: What are one or two or several things you remember from the year or so surrounding that birthday? J: What was happening in the world that year? Do you remember newsworthy events, books you read, movies or shows or art you experienced? E: During 28, I decided to listen to every episode of This American Life ever made. It was almost as if I had a little time capsule in every podcast and felt as if Ira Glass was my husband since we spent so much time together. I also started listening to the Wailin’ Jennys (highly recommended trio of ladies from NY and Canada singing folk music all over the world). I also spent an entire month of 28 in Austin, TX which was thrilling and fun and delicious. I never saw myself as a wannabe Texan, but I’m going back for more next month so I guess that is somewhat significant. E: Oh so close to them. I just had such a fun time flipping through my Google calendar and remembering all the things I did, places I visited, delicious things I ate. 28 was a glorious year and I am grateful to have a chance to relive it. I am also grateful that I am so thoroughly addicted to Twitter and Facebook and keep my life organized on a Google calendar meaning it is easy to access a full archive of my life at the click of a button. Also, that is kind of scary. E: As Oprah would say, own it! Yes, I just quoted Oprah. Or wave your freak flag (one of my new favorite soundbite pieces of advice, I am still not sure of the exact derivation). And lastly, this gem from my college adviser…”When you say no to others, you say yes to yourself.” I think that is pretty good advice at all times, but it was especially useful to me during my Saturn return. Em, Em, Em. Thanks for saying yes to you AND yes to this. Photo courtesy of Emily Goodstein. This entry was posted in People, Projects and tagged 28 before 29, Austin, DC, Emily Goodstein, saturn returns. Bookmark the permalink.